Moms, if you didn't receive a relaxing spa gift, you can treat yourself with this deal! After the busy and hectic holidays, it's time to pamper yourself! 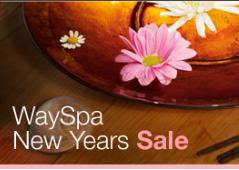 WaySpa is having a New Year special - until January 1, you can purchase a $50 WaySpa certificate for just $39.99 - savings of 20%. WaySpa gift certificates can be used at thousands of spas in Canada and the USA, and there's no expiry date! To view participating spas, search at WaySpa.com. Your WaySpa certificate can be instantly delivered to you by email. Just print the gift certificate, call the WaySpa participating spa of your choice and book your appointment! WaySpa certificates never expire - they make great gifts! You can include a custom greeting, have the certificate delivered by email, or they can mail it to your recipient for you! Check it out at www.WaySpa.com. 0 Response to "Treat Yourself, Moms: 20% Off WaySpa Certificates"